Easy IFP is an amazingly easy to use platform that works on desktop and mobile platforms. Home Builders IFP: Showcase floorplans and allow buyers to interactively explore dozens of design options. Embed Photos, Videos and even 3D Matterport Tours. Apartment Room Planner: Our furniture planner option allows prospective tenants to design and share their living spaces. The interactive floorplan demo below features photo hotspots, multiple floors and many options. HTML5 / jQuery – Built with web standards – no plugins! Touch Interface with pinch-to-zoom and touch dragging. Responsive Design – Fits to any width / height — from tablets to phones with touch friendly menus. Single and All Floors Views – View each floor or all floors at once! Download custom design as an image file! Social Media Sharing – Share your designs! Conditional Hotspots – Hide/Show Photo Hotspots linked to specific options. Option Groups – Color-Coded groups to designate a single choice with multiple options. Option Links – Some options only work together! Option Disable – Some options do not work together! Option Shift – Some options move with other options! Option Priority – Some options need to be on top! Option Logic – Some options need to add and remove other options to work – no problem! We provide a hosted-solution that you can embed in your website using an IFRAME, or a pop-up window — like Vimeo, YouTube, or any 3rd party web-app. We provide you a link to each plan that you order. Yes, revisions are free within 30 days. Additional options are priced at $3/ea and can be added at any time. Do you have a white label version of your platform? A hosted version is available for corporate customers. We require a signed non-compete. Are there monthly hosting fees? Easy Room Planner was created in 2006 as a flash-based furniture planner to serve the multi-family apartment market. Click Here for Demo. 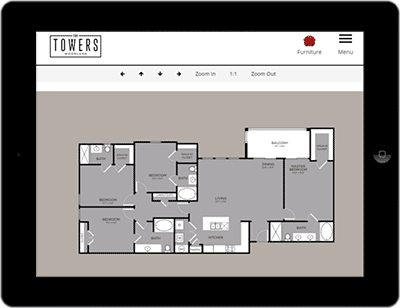 Easy Room Planner v2.0 was a streamlined, variable size (responsive) flash web application. Click Here for v2.3 Demo. Easy Room Planner became EasyIFP in 2012 when it was rebuilt from the ground up as a tool for home builders that would support touch interface devices such as mobile devices and tablets. It was the first standard compliant, iPad compatible IFP on the market. EasyIFP enjoyed a very quiet launch with little fanfare, no marketing and a lengthy beta test with a select group of customers. During this time, we added features such as horizontal flipping, photo and video hotspots, custom interfaces and social media sharing. In 2018, we will be launching EasyIFP v3.8 as a platform that will allow agencies to build their own IFPs for a nominal monthly fee — saving hundreds over other popular platforms! We will still continue offering end-to-end solutions for businesses that need assistance in building IFPs from the beginning to end. EasyIFP is a service of Metroplex360.com. We also offer photography and 3D Interactive Tours powered by Matterport.